We give birth to our children, raise them through tears, tantrums and joy, get them to high school....and then expect that they will head off to college. It's what they're supposed to do. But what happens if that's not the right path for them? Let me tell you a story about finding your passion. My nineteen year old is an amazing young man. He is mature, kind, thoughtful, and has a great work ethic. We're so proud of him and the choices he has made. But just a few years ago, we had no idea where his future was heading. School has always been challenging for C. His grades were good, but he had to study harder than everyone else to get them. My husband calls him a "grinder". Even in kindergarten we could tell that math was especially difficult for him. It was like C was learning a foreign language. However, with his hard work (and the help of some great tutors), he maintained a 3.5 GPA through high school. At the beginning of his junior year, we started to think that maybe traditional college wasn't for him. This was hard to admit - my hubby and I both have college degrees, and we assumed our boys would go the same route. But C had no idea what he wanted to do, and he didn't really enjoy going to school (well, except for the sports and the girls). So one evening we sat him down and asked him what his passion was. We thought we knew the answer, and apparently so did he, because he immediately said "cars". Ever since he was a baby, C has been enthralled with cars. Engineering, performance, styling, everything. I still have over 500 Hot Wheels from his childhood, and he played with and could name every one. We talked some more, and C expressed that he might like to work with cars - high performance cars in particular. Ferrari has always been his favorite, and he never misses a Formula One race. But having a love for cars and actually working on them can be two very different things. Fortunately, C's high school had an auto technology program, and he enrolled his senior year. On the first day he came home and said, "Mom, I've found my people". That was a great moment. The biggest surprise came several months later when he told us that he had taken the initiative to contact the local Ferrari dealership and talk to their service manager. C is a great kid, but he's not known for stepping outside his comfort zone. When they met for coffee, the manager was so impressed with C's passion, he offered to become his mentor. Passion and a willingness to think outside the box - and a bright future was born. In order for C to work for Ferrari someday, there are a lot of things he needs to do first. His mentor recommended a highly respected auto technology program at a local community college. The program has limited enrollment, so in order to be accepted, C had to secure a job working in the auto industry first. Because they most closely resemble the Ferrari model, his mentor suggested Toyota. Last year, a month before graduation, C researched the best Toyota dealership in the area, applied for a job, and was working full time by June. He has spent the last year learning the basics, and every day he comes home with a smile on his face. 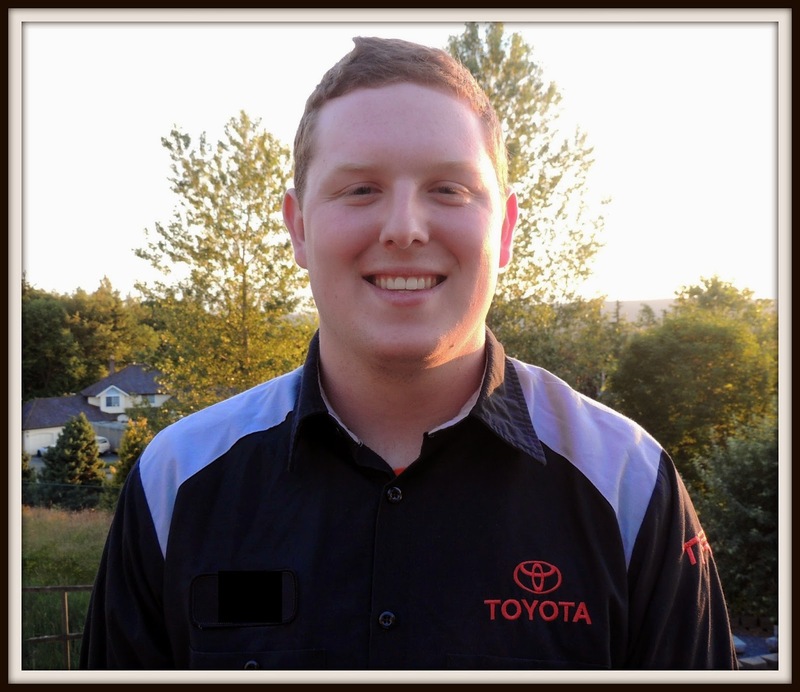 This past Monday C started the T-Ten Program at the community college, and will attend for two years while still working at his dealership. We could not be more proud of him. After he graduates and gets several more years of work experience, he can finally apply to Ferrari. Once hired, he will be sent to Italy to attend their training program for two more years. Beyond that...well, I'd say the sky's the limit. At the young age of nineteen, my son recognized his passion, and he's on his own path to make it become his life's work. He may not have headed off to university like many of his friends, but he's happy and we know he will be successful. And that's all any parent could want. Congratulations! It's great that he found something he wants to do and is taking the steps to make it happen on his own. That's how I know when my kids are really serious. Such joy for parents when kids find their passion! Thank you Marie! We are so happy for him. I totally agree. I had wanted my daughter to have the same experience as I did. But it wasn't for her. I worried a little about him not having the "college" experience. But he doesn't care, so I won't either! Nothing worse than being doomed to life of doing something they don't want to do. Very cool story and I tweeted it! Thanks so much Carol! It makes me happy that he'll be doing what he loves. I'm reading Steve Job's bio now and college wasn't for him. More and more we are learning that college isn't what it is cracked up to be and isn't always worth the money. You son made a good choice. There seems to be a definite shift away from the expectation that you have to go to a 4 year university. It will be interesting to see what the future holds. What a great article! I love his comment, "Mom, I found my people." This is a perfect example of what can happen when we give our kids the freedom to find their niche. Congratulations on a job well done, Mom and Dad. Thank you very much! I hopped over to your site - great information there! You must be so proud of him, what a credit to you both. I know this feeling all too well, my youngest is still to find her passion but I have faith she will. Sometimes it takes a little longer - he was very lucky to know what his was at such a young age. C is lucky to have found a path he loves so young, and lucky to have the parents he does! College is a wonderful choice sometimes, but sometimes the smartest choice is NOT to go to college. This article is an important reminder of that! Thanks Susan! I'm pretty sure he would have been unhappy at college, so I know this was the best choice for him. Awesome! We don't all need a traditional college experience to find our path. C has found his and he is soaring. Congratulations to you both. I don't even know you and I'm proud of your son and really glad that he has such wise, caring people to support him. Smart, smart, smart. What a kind comment - thank you so much! Yay, so exciting! I love that he know what he wants to do and is going after it! What a great kid! For the record, math is like a foreign language to me too! Thanks - he is a great kid! He was the one who finally described math as a foreign language, and it made so much more sense to me! I smiled through this whole post. I have a son who just finished his freshman year of college but feels lost because he doesn't know what he wants to do for a major. I have another son who knows what he wants to do and is driven. There's no right road for every person. Congratulations to your son for finding his passion and following it. Thank you! My boys are the same - my younger son has known he wants to be a vet since he was 10 - and he hasn't changed his mind yet. Congratulations to your son in pursuing his passion! If he is coming home happy that is what matters! Nothing will seem like work when you are doing what you love! I agree Laura! It's great to see him so happy at the end of the day. High fives for awesome parenting! This is fabulous and exactly what every parent wants for their children. Good luck to your son as he pursues his dreams! Thank you. I told him about all the nice comments I received, and he couldn't believe it! Sometimes it's hard to make those choices, but it's always worth it in the end. We are really proud of him! Congratulations to your son and to you! It's so hard for young people to know their passion. Your son is fortunate to have a caring family who will encourage and listen to him. Have a great weekend. Thank you so much! Hope you have a great weekend too! This was me when I was his age. Although I can't say that I was mature enough to know my one true passion back then. Heck, I still don't. The path we're "supposed" to take doesn't work for everyone and I think it's great that your son realized that. My path has been long and twisty! Thanks so much for stopping by! This is so timely for me with my Teenager just graduating High School and heading to College. All through school he would tell me 'I'm not you Ma' when I would question grades, honrs, etc. I finally got it and once I stepped back a bit he began to blossom and excel on his own. It can be hard to 'let them go' and see what they choose but it is so worth it in the end. It was hard when I first realized that he just wasn't that "college" kid - but I got over it quickly, and he's so happy now! My son just finished Kindergarten and I wonder if he will be the "college type". I've always believed that it's not for everyone, but I want to be sure I encourage him because I dropped out of college and it turns out it really *was* for me. I miss it, and I'm only 12 credits away from my degree, but what would I do with it? I might use it to stroke my ego, but not much more these days. If it's important to you, then you should do it :). The hardest part was trying to figure out what he wanted, without swaying his decision too much. What a wonderful story! It's so lovely how you were able to set aside your expectations and see what your son really needed and who he was and support that so whole heartedly. My kids are 16-23. It can be a tricky thing to let them find their own way. I will keep your story in my heart as I help my children become adults. Thank you for the nice comment! It was definitely hard to step back and realize that what I thought was best might not be right. He is so confident and happy, so I know it was the right decision! Inspiring story! Our kids have found their niche in several places. The Arts. Hospitality Management. Law enforcement. Special Needs care. And we are so proud of every one. We did what you did. Asked each one what they were most interested in doing. And this is the result. They'll never be rich. But they'll be happy! I was talking to one of my cousins and asked her what she wanted to work toward. She said she wanted to study in the Arts. I started to say, "Perfect!" except that she broke in with, "But my parents say, 'Arts?! Do you want fries with that?!'" I was so sorry for her. And her parents. Thanks Diane. The hardest part as parents is to remove your expectation from the mix, and listen to what the kids are saying. Easier said than done, since we want the best for them! Wow, what a nice compliment! Thank you so much!!! I'm not really looking forward to the Italy part (although it will be fun to visit). I will definitely keep everyone updated on his progress. Thanks again! Thanks Julie. Glad to hear that your brother found what he loves to do. It definitely makes like more enjoyable! Congratulations! He sounds just like my son was. He wanted to enlist in the marines right after graduation at 18. He and I made a deal if we waited one year I would fully support it. He did and I'm a very proud Marine momma. He's traveled all over the world. I bet you are so proud of your son - how cool! Congratulations to your son C for having the passion and drive to achieve his dreams! And congatulations to you as the parents, for fully supporting him and encouraging him to do what he loves. I'm impressed that at a young age he knows what he wants and he makes in roads to make sure he gets to his dreams. When I was that age, I was shifting majors in college because I couldn't really figure out what I wanted. It's also great to hear that someone is stepping up to mentor him! Mentorship is rare these days even in the corporate world. If someone is committed to your success (not only family) then the road is much more manageable. Good luck to your son and wish him all the best! Thank you Karen! I agree, it's very hard to find someone who will take the time to mentor these days. Both my boys have been lucky, and have found mentors in their chosen field. Great share I always told my daughter to give collage a try this way she would know for sure. I also always told her as long as she was happy and found her passion I would have her back. Glad your son found his passion :) college is not an end all be all life has many paths! Be happy I say. Being happy really should be the ultimate goal, but we forget that. Thanks for the nice comment! Oh my gosh, I absolutely love this! Congratulations to him and you!! Our son is stuck on college but he's been struggling from the start. He is now taking one or two classes at a time and working. He hopes to be a nurse some day. I think we do our kids a disservice by assuming everyone will go to college. I think that what you all are doing is wonderful! Thank you! College definitely isn't for everyone. Good luck to your son! It's so wonderful to hear about someone who is encouraged to follow his dreams. The road ahead may be bumpy, and will take a lot of patience, but I know your son will get there. Thank you so much! I appreciate you stopping by and reading. she adores horses and spent two summers working in the horse industry while in highschool - she is now about to enter her second year in college doing a degree in Equine Management. It is fantastic when you see them follow their dreams. How cool - that would be a fun career! What a wonderful story! Great job, mama. Happy SITS Day! There is definately a lot to know about this subject. I like all of the points you've made. I cried when I read this post. This is all we want for our kids. For them to be happy. Well done! Wow, I'm so impressed! What a great kid! I came from Mama Kat's to read your Snow Day and kept reading a few more posts till I got to this one, they were so enjoyable. Greetings I am so excited I found your web blog, I have book-marked it, when I have time I will be back to read a lot more, Please do keep up the great job. Hello friends if you are want to play on front foot with any Independent Hyderabad escorts angel girls, do not worry because Tanvi Ahuja offer this type service for each an everyone. Thank your site! information your share is useful to me! it's great that I known this site! Great and interesting to read this article, I would like to thank you so much to share with us. Your sun is cute boy..